← What does the Bible saying about hunting for sport? A good PH makes all the difference! In general, men are all about the task. In general, women are all about the relationship. Men go out to hunt to get their trophy. Women go out to hunt and worry if they are going to make a fool of themselves in front of everyone, whether they are going to hit the target, whether the others on the hunt are going to like them, and even talk to them, whether the PH will be nice and understanding of their nervousness, whether they look good in the hunting outfit, whether their hair looks good in the pigtails, whether they are going to need to go to the bathroom out in the bush and have to remove all the layers of clothing, whether they are going to be able to climb off the bakkie, and take hold of the gun and position it on the sticks, and sight in the animal, aim at the kill zone, breath normally, exhale and squeeze the trigger before the animal moves away, and finally whether they get their trophy! An excellent professional hunter (PH) knows how to manage these differences and still make both men and women enjoy their hunt and get their animal. 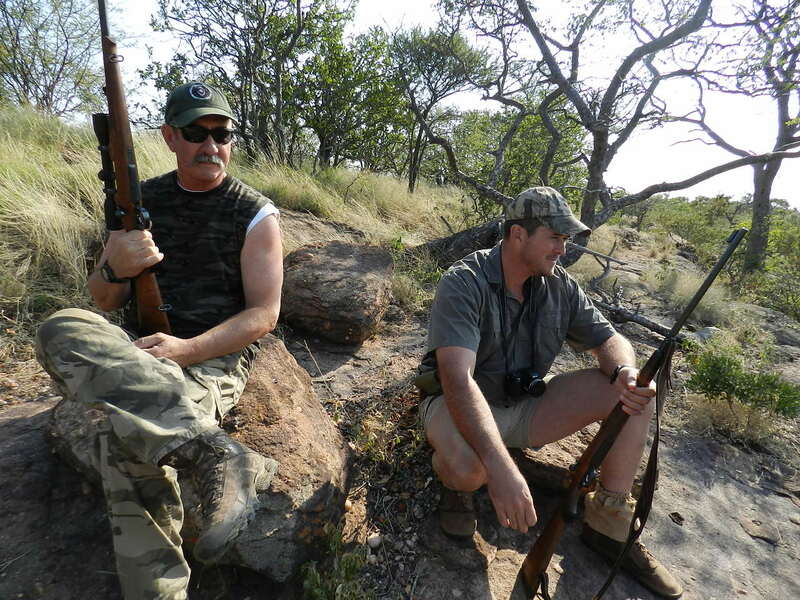 At our recent South African safari, my’s first hunting experience, we had a most excellent PH. Before I write how wonderful he is, let me explain a few things about PH’s. A PH in South Africa has to be licensed. The PH has to attend a course to qualify as a professional hunter and outfitter. 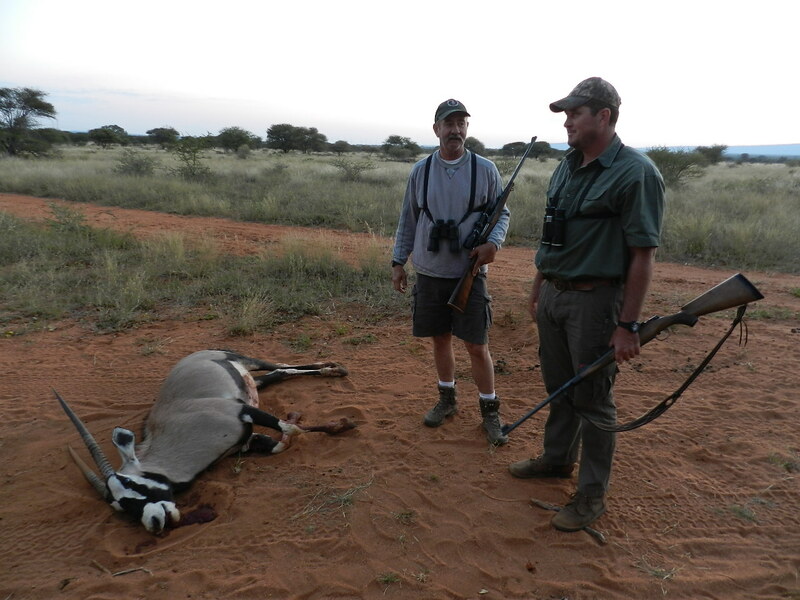 After he/she has completed the course successfully he/she will be qualified to guide a client on a plains game hunt. 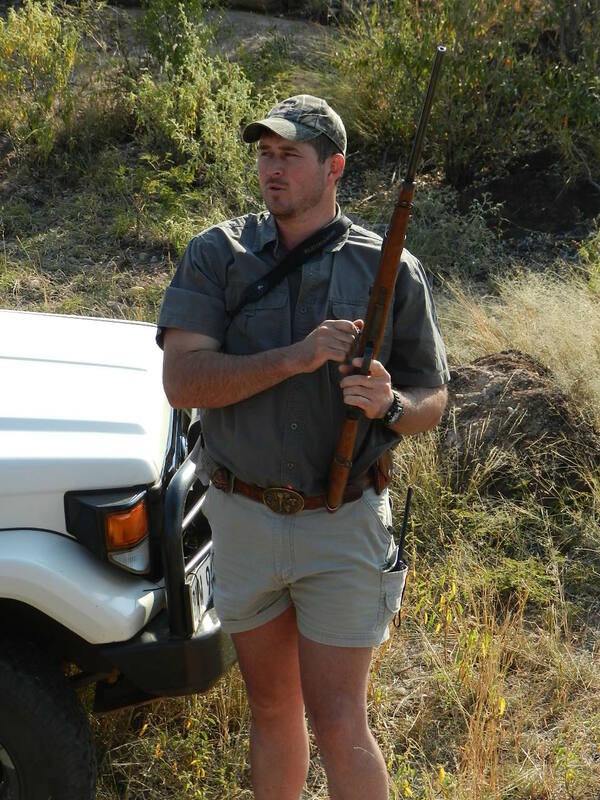 If they can provide sufficient proof of their hunting experience of the dangerous six (cape buffalo, elephant, lion, leopard, black and white rhinoceros), they qualify to guide a client on any of the dangerous six hunts. Their coursework includes: laws; tracking; hunting ethics; bullet placement and skill; general knowledge of firearms and ballistics; firearms – safety; clients; repair and maintenance; sighting in of firearms; photography; bowhunting; handling of trophies; loading; transporting and skinning; measuring methods RW and SCI; ecology; facilities – camp and vehicles; horn judging; bird shooting; bird identification; first aid; outfitter; hunter and client relations; administration; marketing, etc. Their outfitters license will only be issued after enough experience and certain criteria. • shall not act in any manner that brings the good name of PHASA and it’s members into disrepute. A PH will honor and apply this code of conduct, his/her knowledge and experience so that his/her client has a successful hunt. An excellent PH will go above and beyond what is expected of him/her. With that, let me explain why our PH was excellent. As I wrote earlier, this was my first hunting experience. As much as I tried to appear calm about it, I was nervous. Bwana Mbogo knew I was nervous and made sure to address my condition by explaining, in quite a bit of detail, all of my questions and concerns. Despite all the questions and answers and preparations, we both knew that I wouldn’t relax until I’d actually walk the talk. Bwana Mbogo and I both told our PH that this was my first hunt, ever, that first early morning hunt. when the animal was positioned for a good shot, he would set up the sticks, and I would lay my rifle on it, and sight the animal in the scope and take the shot. And that was exactly what we did. We spent the morning hunt and the first part of the afternoon hunt of the first full day of the safari spotting an animal, getting off the bakkie, and tracking the animal (this was when I realized that I needed to be in better shape as I was panting quite a bit), laying the rifle on the sticks and sighting in the animal. For various reasons, I was never able to take a good shot. Our PH never pressured me to take a shot, and kept emphasizing that I needed to be comfortable and was supportive when I didn’t feel I could get a good shot. Each time we did this, I felt more and more comfortable with what had to be done. I was walking the talk! Our PH also made sure to check things with Bwana Mbogo. Given that Bwana Mbogo is an expert hunter, and he’s an expert about me, our PH knew to consult with him about questions I would have no idea how to answer with respect to the hunt! In my post about my first animal, Twiga’s First Safari Animal, I describe how our PH took care of me and the animal. 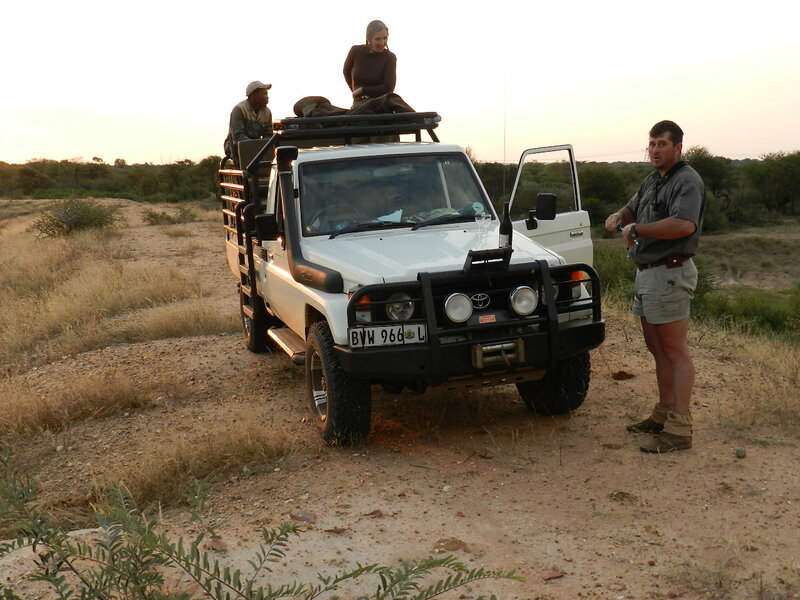 When we returned back to the lodge with the gemsbok in the back of bakkie, we dropped off the animal with the skinner and we discussed what we wanted for the trophy. That evening, he made sure we had a beverage to celebrate my first animal. 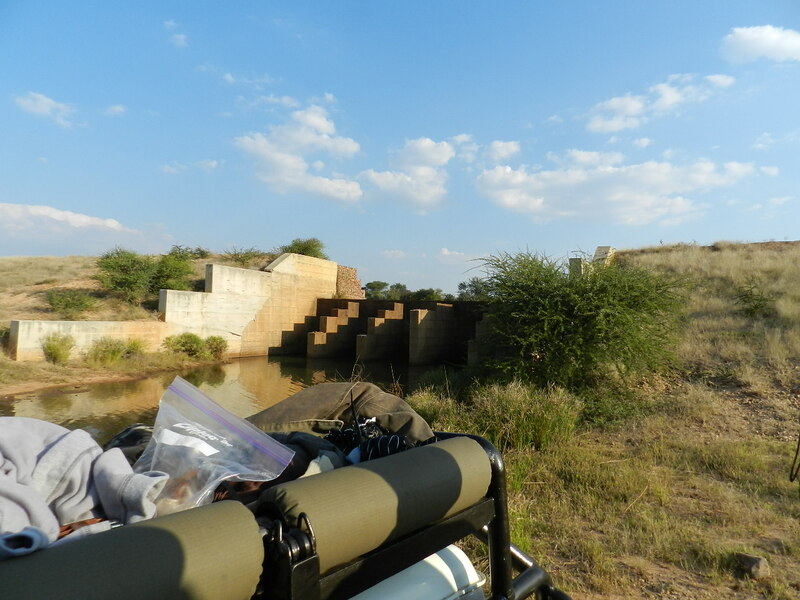 On the second day’s hunt, we went to a neighboring game farm. I’ll leave the story of that day’s hunt for another post as I want to get to the really good stuff that our PH did for us. 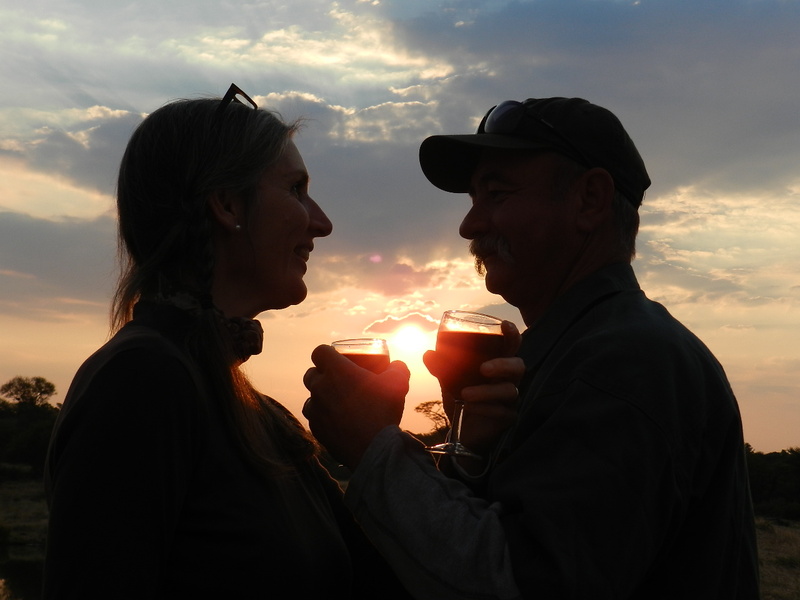 During one of the many drives in the bakkie looking for the animals, we happened to mention to our PH that this trip was our honeymoon. This piece of information got to his romantic side! That evening, after cocktail hour, we were told that we needed to go back to our tent before dinner. We did as we were told, and found that our PH had ordered a romantic, lantern lit dinner for us on our tent porch! And it included a bottle of wine! It was lovely! Bwana Mbogo and I enjoyed it tremendously. Unfortunately, I forgot to take photos of the dinner in my surprised state! The next morning, I was feeling the effects of our romantic dinner, so Bwana Mbogo went off hunting without me. Sleep and a really good cup of coffee with a hearty breakfast cured what ailed me, and I was ready to greet my happy Bwana Mbogo when he came back with his kudu at lunch time! Finally, on our last day, we were unsuccessful in getting our last animal, but our PH made sure we ended our safari with a bang! Towards the end of our evening hunt, he had his tracker drive us to a reservoir. We were going to celebrate our honeymoon and my first safari! 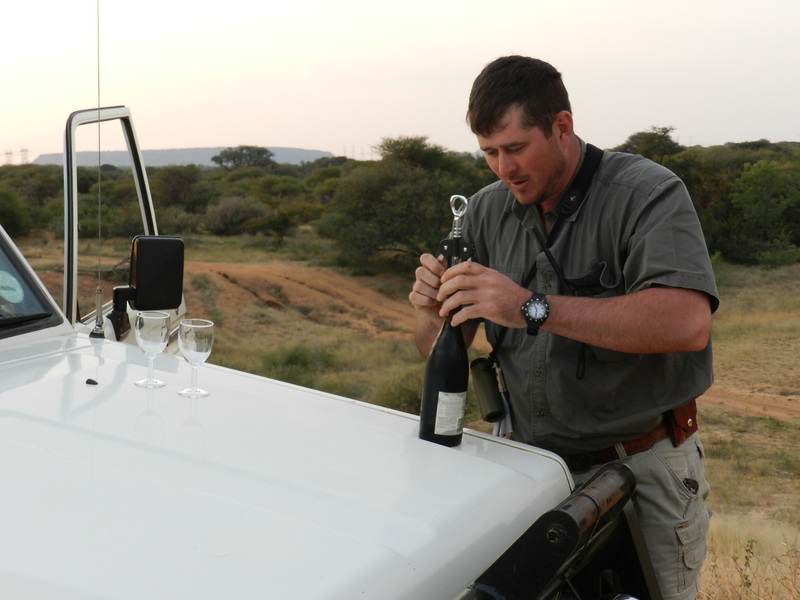 An excelent PH makes sure you stay safe, you get your trophy animal, and fills your safari with exceptional experiences and memories! This entry was posted in Africa, Hunting Experience, Professional Hunters and tagged Africa, Hunting, Law, Outfitter, Recreation and Sports, South Africa. Bookmark the permalink.